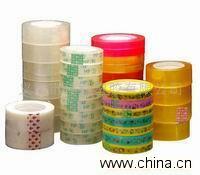 tape is ideal for school and office use, light packing, mending and inforcing documents which can be equipped with dispenser. Color: clear, brown, tan, red, white, black yellow,yellowish,blue, green,etc. Our products are of good quality and special price,if your are interest,please contact us by mail or phone freely!